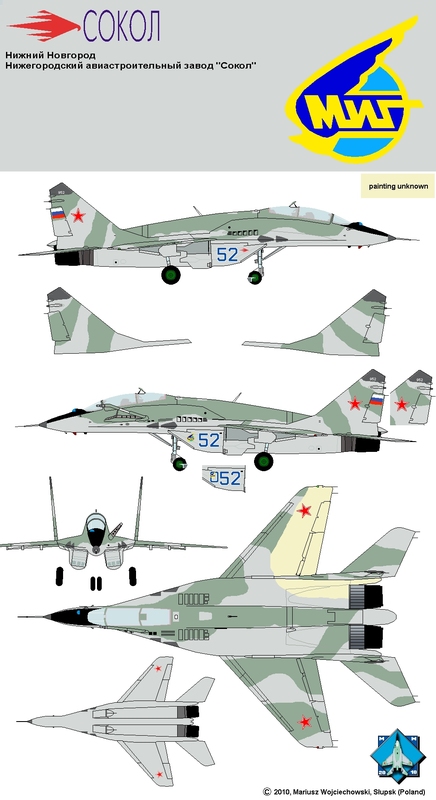 Project 9-52 was a double-seater training version of a multi-role MiG-29 SMT 9-17, called MiG-29UBT (T for Toplivo = Fuel). 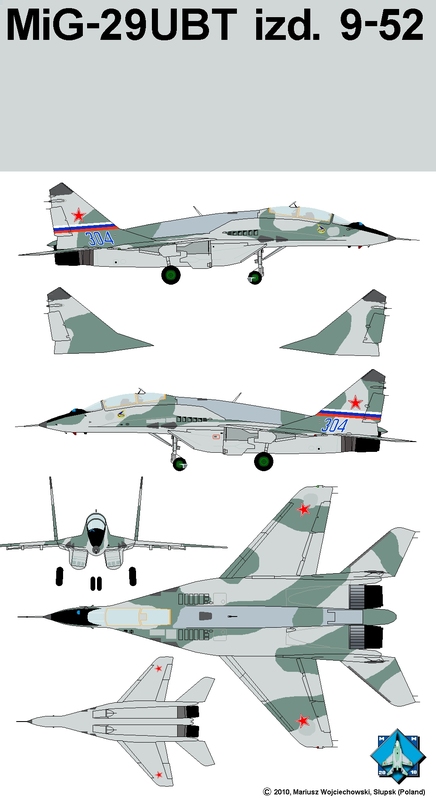 Only two prototypes were built between August 1998 and in 1999 and project was cancelled, as MiG-29SMT 9-17 itself. MiG-29UBT #304, Russia 1998. Please note slightly different colour of the attached dorsal "hump" with two tanks inside. Belongs to MiG bureau aircraft #304 (serial MiG-29UB, 9-51) was well known in nineties from foreign visits, before conversion to UBT. Drawing accuracy: 100%. MiG-29UBT #52, Russia 1999. Fully equipped MiG-29UBT with small ☢radar "Osa". No serial production ever. At some airshows with number #052 (with added smaller "zero"). Drawing accuracy: 95%, horizontal stabilizers may be not exact. When projects 9-17 and 9-52 were abandoned in 1999, new lines of the SMT was later developed: 9-18 and 9-19.